During the first week of the first quarter of the New Year, the Dow Jones Industrial Average rose above 25,000 for the first time ever. Less than two weeks later, it closed above 26,000. The Standard & Poor’s (S&P) 500 Index and NASDAQ Composite also reached new all-time highs. Improving expectations for American companies can be credited, in large part, to tax reform, which lowered corporate tax rates significantly. In addition, rising oil prices may help companies in the Energy sector, and rising interest rates may give a boost to companies in the Financials sector. Despite a robust global economy, strong earnings, and improving earnings per share (EPS) expectations, the major U.S. stock indices delivered negative quarterly returns for the first time since 2015. On March 29, the last trading day of the quarter, the Dow closed at about 24,100. Market declines may also reflect concern about valuations. One financial professional told Financial Times many asset classes have gone from being very expensive to being expensive. They haven’t yet gotten inexpensive. The last week of the quarter was a good one for U.S. stock markets, which pushed higher. 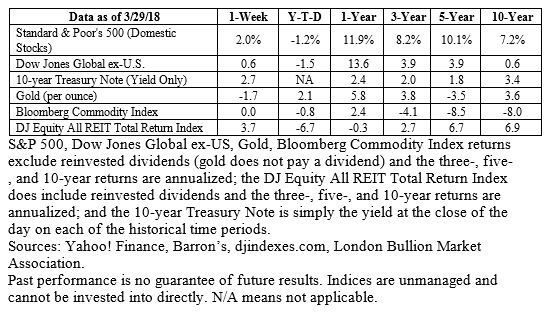 However, the major indices were unable to overcome deficits accumulated earlier in the quarter. The Dow Jones Industrial Average gained 2.4 percent last week, finishing the quarter down 2.5 percent. The S&P 500 Index was up 2.0 percent last week, down 1.2 percent for the quarter. Likewise, the NASDAQ bounced 1.0 percent last week, but ended the quarter down 2.3 percent, reported Barron’s. AI seems to have missed an important governing rule for recipes: Instructions should not include unlisted ingredients and all ingredients should be included in the instructions. DATE HOLY is particularly baffling. The author suggested the neural network might have been trying for frosting. It is a cake, after all.